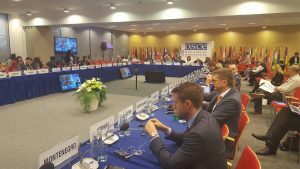 The chairman of the Mosque was invited to address the Human Dimension Implementation Meeting (HDIM), organized by the OSCE Office for Democratic Institutions and Human Rights (ODIHR) in Warsaw, Poland. As Europe’s largest annual human rights conference, the HDIM (http://www.osce.org/odihr/hdim) brings together hundreds of government officials from all over the world, international experts, civil society representatives and human rights activists to take stock of how states are implementing their commitments in the human dimension, in other words, the core values that promote respect for human rights and fundamental freedoms­. This year’s event, it was held in Warsaw, Poland from 11-22 September. The session was about “Tolerance and non-discrimination”, and the Mosque’s presentation was about the rise of Islamophobia, positive community engagement and how FPM react to the terrorist attack in Finsbury Park area. The chairman speech at the beginning of the video below, but you will be shocked to discover the scale of hate and intolerance against Muslims and Islam by some of the so called civil right organisations from USA & Europe, we advise you to watch it all, or the beginning and the last hour of it. This session supposed to be about promoting tolerance and tackling hate crimes, but what we experienced is intolerance and promotion of hate crimes against Muslims and Islam!